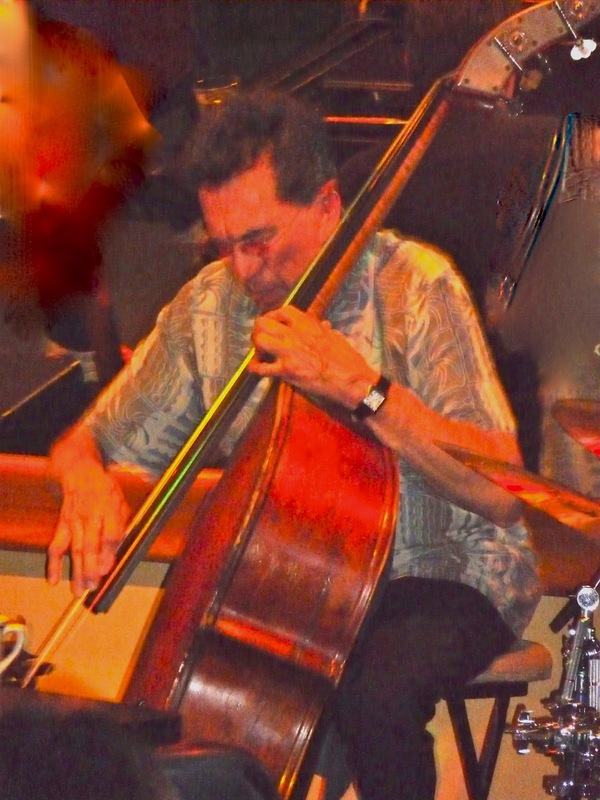 Music lovers in the Coachella Valley have the wonderful opportunity to see and hear one of the greatest living bass players in the country, Jim DeJulio. Jim began his career in Pittsburgh, Pa and was honored by being inducted into the Pittsburgh Jazz Hall of Fame whose members include Ray Brown, Earl Gardner, George Benson and the Tarentine Brothers---not bad musical company. Jim's first instrument was the accordion; but after a years or so, he was attracted and captured by the soulful sound of the bass. From the first day Jim bought his first bass, he practiced every free minute he had almost to the exclusion of everything else in his life. Jim's training was not limited to jazz. He received classical training from musicians in the Pittsburgh Symphony which helped him develop his remarkable bow work. Because of the time he dedicated to practice, it was not long before Jim was performing with the greatest jazz musicians in the New York area including Chet Baker, Sonny Stitt, and Herbie Green just to name a few. After Jim relocated to the West Coast, he worked with Phil Woods, Conti Condoli and some of the greatest singers of the Great American Songbook like Anita O'Day, Nancy Wilson, Carmen McCrae, June Christy, Johnny Mathis, Sammy Davis Jr, Barry Manilow and Frank Sinatra. In fact, whenever Frank was in the Desert and wanted a bass player, Jim always got the call! Also, Jim's marvelous resume includes his playing in the Mike Douglas Show orchestra for 18 years. I first heard Jim play at Vicky's of Santa Fe in Indian Wells where he plays with Pat Rizzo on Mondays and Tuesdays. What really made me a Jim De Julio fan was more than just his outstanding musical dexterity, it was his feel for melody, especially ballads from the Great American Songbook. Few Jazz musicians, even among the great ones, have the ability to capture not only the emotion of the music but the lyrics as well. Miles had it, Chet Baker had it, Coltrane had it and our own Desert favorite, Steve Madaio has it. In my opinion, Jim De Julio is a charter member of this select group. Jim has several CDs out that I have listened to and they are simply terrific. "It's All About Time" was published in 1992 but it sounds as good today as when it was cut. Jim is joined by a great cast of players including David Benoit, Eddie Daniels, Bill Watrous, Roy McCurry, Paul Smith, Wally Minko, Lou Forestieri and Chris Trujillo. When you get this CD, check out the bass solo Jim performs on "Dewey Square"; it is out of this world. There are two other songs that I keep playing over and over, "It Never Entered My Mind" and "Have You Met Miss Jones". The musical quality of these songs is as good as it gets! Jim also put out "Take It From The Bottom" that contains some great songs like "Samba d'Marianne" that Jim wrote; the Jim Van Heusen gem, "I Thought About You" and a fine recording of "Amazing Grace". Also, Jim plays a 2 minute solo on "How High The Moon" that gives me chills; it is that good! The last CD I listened to was "The Jim DeJulio Jazz Quintet". Jim is joined by top class musicians, Peter Christlieb on tenor, Conte Candoli on trumpet, Pamela York on Piano and Joe La Barbera on drums. I was surprised to see that Jim wrote five great songs for the CD. I went back and checked the other CD's and found that Jim had written songs for these CD's also. He is truly a remarkable musician in all aspects. And this is simply a rock solid jazz recording! You can buy these CDs on iTunes or CD Baby, and I highly recommend them all.